I’ve debated posting on this topic for a while now, because I feel like I don’t have a ‘perfect’ answer or response to this question, so I didn’t want to speak up about it. I realized, though, that I’ll never have the perfect answer, but I do want to start a conversation about this and pose the same questions to you! 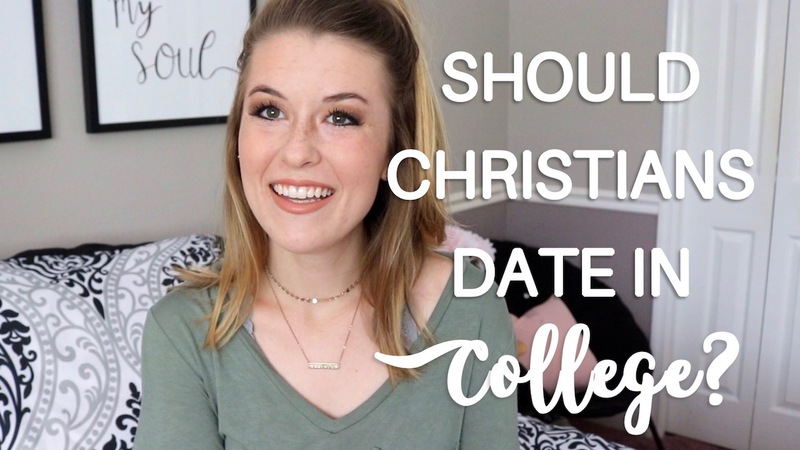 Should Christians date in college? Should Christians date in high school? Is there an age that’s too young to date? Click to watch the video edition of this post! I always like reading/watching Christian bloggers’ responses to these questions. I talk about my relationship experience in the video (lol) and my own thoughts on dating in college. To be honest (as I like to do around these rosy parts), I was criticized by my close Catholic/Christian mentors (youth ministers, parents of friends, etc.) when I got out of my first real relationship at 16 years old with the idea of ‘dating to marry’ implanted in my brain. These adults, who I looked up to in both life and faith, claimed I was ‘too young’ to be thinking so seriously about dating. Personally, that advice and statement has never struck right with me, even to this day. How can we raise young Christians to want Godly marriages that last, but criticize them for being ‘too young’ to think or want a Godly marriage when seriously discerning romantic relationships? I know their intentions were good in saying these things to me. I know they really were just thinking I was ‘too young’, but I still disagree. I still can’t reconcile their surprise at me not wanting to date unless it was someone I could truly see a future with, with their overarching hope for me to become a ‘good adult Catholic’ and eventually marry in the Catholic church (as they’d want for many of the young people in the church). Like I mention in this video, I do think there is an age that is ‘too young’ to date, but I definitely was past that ‘childish’ point in age and maturity in my life. Because of this, it still rubs me the wrong way to think about the Christian adults in my life that brushed off my serious approach to dating at 16. It makes me wonder what would’ve happen if I had listened to them, and changed my approach to dating to be much less serious and not-marriage-focused, as apparently was ‘appropriate for my age’ at only 16. Maybe I’ve just taken these words too seriously, but four years these adults told me I was ‘too young’ to only want to date someone I could truly, honestly see myself marrying, I still remember what they said and how that made me feel. Maybe there is an age that’s ‘too young’ to date, but I don’t think there’s an age that’s ‘too young’ to set your mind and heart on holding out for a Christ-centered relationship. I pray that God has marriage somewhere in my future, and I’m glad I’ve never taken dating lightly, even from a young impressionable age. I’d love to hear your thoughts on this topic in a comment below! While you’re here, I hope you’ll subscribe to my (new & improved) YouTube channel by clicking here, and my blog via the pretty pink box below!